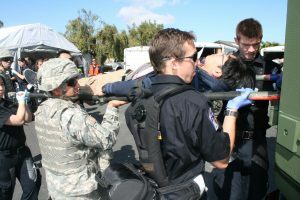 Military personnel work together with civilian EMTs to transport a volunteer patient at Operation Urban Rescue on April 5th, 2014. When the next big disaster hits California, will you be ready? 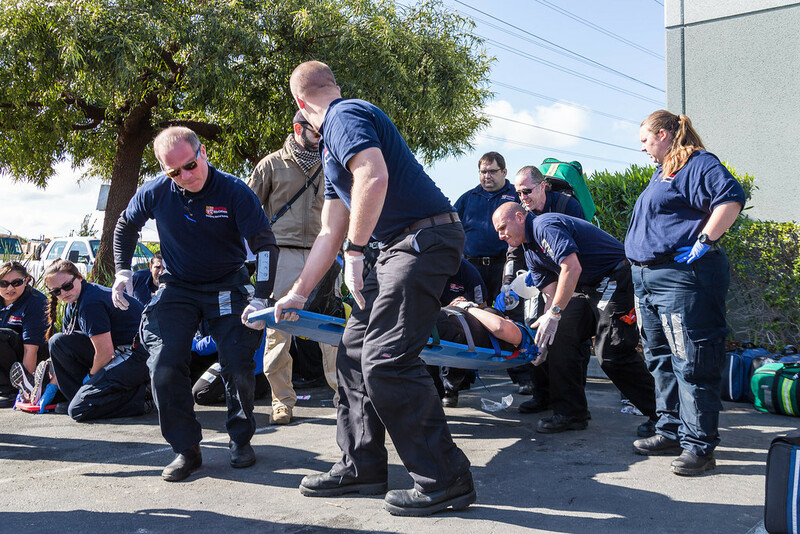 On April 5th, Unitek EMT hosted Operation Urban Rescue, a mass-casualty simulation designed to prepare emergency medical services for future disasters. By incorporating military, civilian, and student emergency medical services into one training event, Operation Urban Rescue aimed to prepare the community of Fremont, California for future disasters. To mimic the response required for a large-scale catastrophe, Operation Urban Rescue featured a huge disaster area, two scenario hospitals, an active ambulance circuit, dynamic extraction lanes, and a dedicated helicopter landing zone. More than 600 people participated in Operation Urban Rescue, including 32 government agencies, 264 volunteer patients, 40 medical instructors, and 245 military personnel. Participants responded to an armed insurgent threat, improvised explosive devices, hazardous materials, critical medical conditions, and a massive disaster scene. Unitek EMT students transport a volunteer victim for helicopter extraction. Photo by Jim Sakane, 2014. Operation Urban Rescue also served as a training exercise for Unitek EMT students, who gained first-hand knowledge about treating critical injuries in a disaster setting. 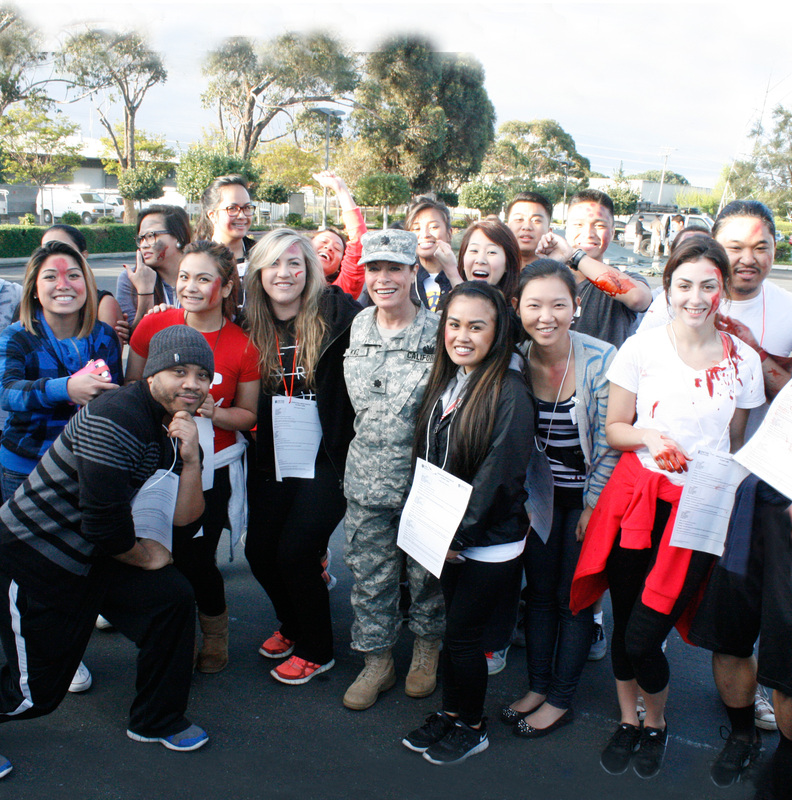 Students worked alongside instructors and military and civilian personnel to treat simulated injuries in the field. They also had the opportunity to transport patients to helicopters for further medical care at Washington Hospital. Intensive training events like Operation Urban Rescue help students to become the elite EMTs that go on to serve our community. To provide training and increase community preparedness, Operation Urban Rescue simulated specialized scenarios. The Fremont Police Bomb Squad and S.W.A.T team took steps to contain hazardous materials and ensure patient safety. Volunteer patients also participated in a California National Guard Civil Support Team decontamination drill. Throughout the event, CALSTAR and the Sonoma County Sheriff’s Office transferred patients via helicopter for treatment in nearby Washington Hospital. Practicing life-saving techniques can only help to reduce loss of life from future disasters. Operation Urban Rescue was a huge success for everyone involved. The Mas-Cal Training exercise provided a unique opportunity for military and civilian personnel to train together in the field. Additionally, Operation Urban Rescue served as a training exercise for Unitek EMT students. Operation Urban Rescue demonstrates that practice is one of the best ways to prepare communities to provide emergency care during a disaster. Our mission is simple: train elite EMTs. Unitek EMT’s 14-Day Boot Camp is an extraordinary program that prepares students for their NREMT over 2 weeks of intense training and real-life simulations. I spent 10+ years as an ER RN, and before that I wokerd the road as a paramedic for a private company with a county contract. We never had theme music to back us up :>I wokerd in Florida and I transported a lot of patients to and from home and nursing homes. They can’t go by car and are confined to bed so someone has to do it. Sure I’ve wokerd thousands of codes and I even had 1 guy who was struck by lightning… as I watched, on my way to work in the ER… live. He got CPR within 15 seconds of being struck and was defibrillated within two minutes. Seldom do codes survive but it is nice to see it when it does happen. Prehospital care is not the career to choose if you want to make a lot of money, or work regular hours, or for that matter work in a nice indoor office. However if you want to truly help people than it is a wonderful career, and often a stepping stone to other healthcare careers. I know many RNs who started out as EMTs and medics, and quite a few docs who did so too. Oh, and few people pull over for an ambulance anymore. With A/C in Florida and the ubiquity of mobile phones the sirens will have to get much louder to get the compliance they did 10 or 20 years ago.